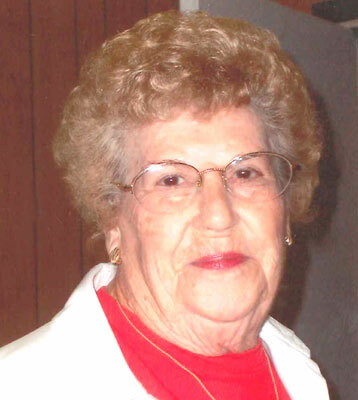 MARY ETTA ''MINNIE'' DAVIDSON AUSTINTOWN – Funeral services will be held at 11 a.m. on Tuesday at the Lane Family Funeral Homes, Austintown Chapel, for Mary Etta “Minnie” Davidson, 93, who passed away Thursday morning at St. Elizabeth Boardman Health Center. Mary was born Sept. 12, 1919, in Bluefield, Va., a daughter of the late John H. and Laura Etta (Bowling) Lawson. She had worked for Thornton’s Laundry and Dry Cleaning for 30 years, retiring in 1982, and was a member of the West Austintown First United Methodist Church. Her husband, Fred H. Davidson, whom she married May 14, 1943, passed away Aug. 6, 1999. Mary will be sadly missed by her three children, Roger (Pam) Davidson of Tucson, Ariz., Barbara Burnett of Austintown and Jerry “Duke” (Nancy) Davidson of Austintown; one sister, Marie Caldwell of Bluefield, W.Va.; 12 grandchildren; 23 great-grandchildren; and 13 great-great-grandchildren. Besides her parents and husband, Mary was preceded in death by seven sisters, May Pugh, Olive Yost, Elizabeth Yost, Ira Yost, Lucille Hoops, Ruby Riggs and Grace Tacito; one brother, Sam Lawson; and two grandchildren, Scott Baker and Sharon Powell. Mary will also be missed by many friends of the Austintown community. The family would like to express a special thank you to Briarfield at Ashley Rehab, especially Justin and Linda and the Assisted Living Group at Briarfield Manor. Memorial contributions may be made to the West Austintown First United Methodist Church in Mary’s name. Friends may call from 5 p.m. until 8 p.m. on Monday and from 10 a.m. until 11 a.m. on Tuesday at the funeral home. Family and friends may visit www.lanefuneralhomes.com to view this obituary and to send condolences.